On 1 August 1972 the city of Hemmoor and the municipalities of Hechthausen and Osten formed a comprehensive municipality. It is a blue over red horizontal bicolour with centred arms. The shield is quartered, above right red scales Argent beneath a fess wavy Argent, above left Argent a kettle hook Sable, beneath right Argent a demi-double-headed eagle Gules armed and tongued Or couped per pale, beneath left Azure three lozenges Argent ordered 2:1. The quarters above are representing Hemmoor city, the quarter beneath right is representing Osten municipality, the three lozenges are probably representing the three municipalities forming the comprehensive municipality. For more details see Hemmor city. The shield is parted per fess, above Azure a winged pike Argent crowned Or, beneath Argent three piles reversed Azure. The upper half is taken from the arms of the Hechthausen kin, the lower half from the arms of the Marschalck von Bachtenbrock kin. The pike (German: Hecht) is a canting element. The shield is parted per fess, above parted per pale, at dexter red a pair of scales Argent and a sinister bendy barrulet Argent in canton, at sinister Argent a kettle hook Sable, beneath Azure a cogwheel Argent with four spokes in saltire. The barrulet wavy is representing Oste River, the scales are representing trade local jurisdiction, the kettle hook is representing agriculture and the cogwheel industry. According to the minicipality’s Hauptsatzung from 19 November 1996, last updated on 7 February 2002, there is no municipal flag. §2 only mentions the existence of a coat of arms and a seal. There is however used a flag. 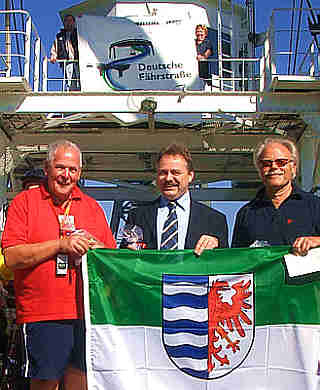 In the public session of the municipal council on 28 June 2006 at TOP 5 is mentioned "a flag with the municipal coat of arms", not a municipal flag, which was ordered by the council due to strong interest of the citizens. You can see an image of this flag at this webpage. There is a photo of members of the "Schwebefährverein" proudly presenting the flag. image from the municipal site. Description of coat of arms: The shield is divided per pale. The dexter half shows a blue field superimposed by four silver fessy, wavy lines. The sinister half shows a half sinister facing red eagle in a silver field. The wavy lines are symbolizing the little river Oste and some creeks in the area. I have no information about the red eagle. But the coat of arms is based on a seal of the Kirchspiel Osten from 1633. As far as I know, the region then belonged to the Bishopric of Bremen. I guess, the eagle is a symbol of some local kin. Note: According to Hautsatzung the eagle is armed and tongued golden (and also on Hemmoor’s website), but on this website it is armed and tongued red, and also on website above.